RINGO2 was decommissioned in October 2012 and recycled in part to become RINGO3, the new tri-band polarimeter. RINGO3 is now in use on the telescope; see the RINGO3 page for details. The information presented here is for historical purposes only. RINGO2 is a fast readout imaging polarimeter. It uses a rotating polaroid that rotates once per second. Unlike the original RINGO which used deviating optics to spread the time varying polarized signal into rings, RINGO2 uses a fast readout camera to capture this signal as it changes in time. 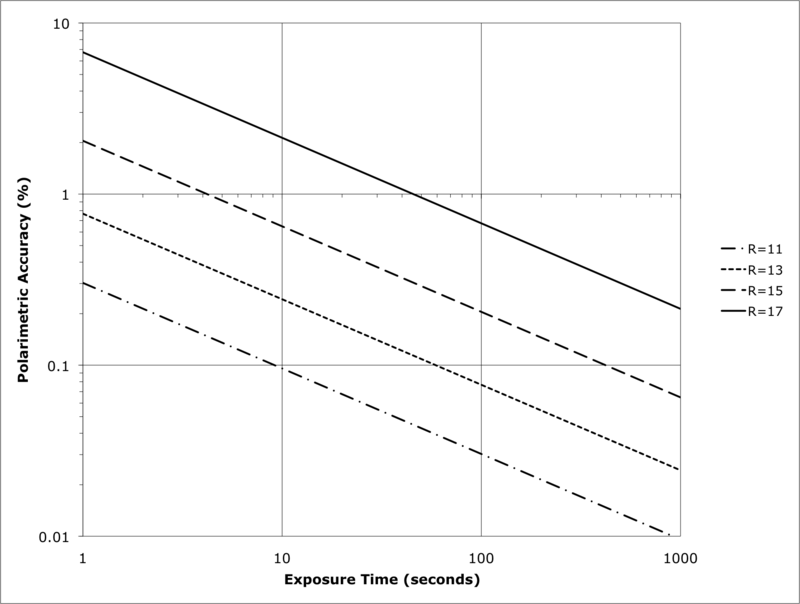 Eight exposures are obtained per second synchronized with the rotation of the polaroid. Combining the eight images allows the polarization to be determined. The system uses an EMCCD, meaning that the read noise is negligible and allows combination of the frames without penalty. Fainter objects can therefore be measured by simply stacking frames. Overall the sensitivity of RINGO2 is about two magnitudes better than RINGO, as the contribution of sky noise to the measurement is much reduced in the new design. 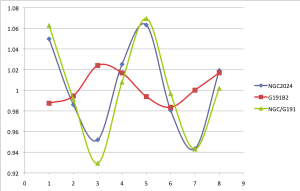 Above left is a predicted sensitivity curve, while at right are example polarization traces for the zero polarization standard star G191B2 and two polarized objects. Click images for bigger versions. RINGO2 uses a hybrid "V+R" filter, consisting of a 3mm Schott GG475 filter cemented to a 2mm KG3 filter. The resulting bandpass curve is shown below, compared to Bessell V and R filters. Two types of standard are necessary to reduce RINGO2 data. These are zero-polarized stars, and objects with known polarization. The zero-polarized standards are necessary to remove the instrumental polarization from the data. 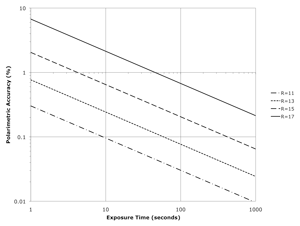 The polarized standards allow you to calibrate the effect of instrumental depolarization. These standard star observations must be obtained at the same MOUNT (not SKY) position angle as the science data. In general we recommend using a MOUNT position angle of zero for all RINGO2 observations (science and standards). 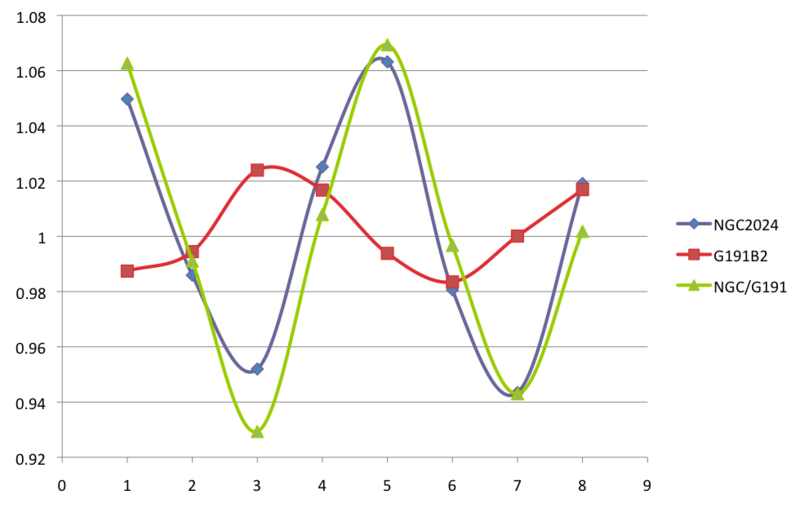 Calculation of a true sky position angle for your data (and hence polarization angle) is possible by using FITS keywords. In the FITS headers the sky position angle is stored in ROTSKYPA and the mechanical mount position in ROTANGLE. In order to avoid saturation, which permanently degrades the response of the EMCCD, RINGO2 fields must not contain objects brighter than 8th magnitude. As RINGO2 produces approximately 8 CCD frames per second (one per rotor position) it is not practical to archive or distribute the raw data from the instrument. A initial data reduction pipeline at the telescope therefore stacks all the frames at a given rotor position within a multrun and normalizes by the number of frames in the stack. A multrun of any length will therefore produce 8 files, named p_*_N_0.fits where N varies from 1 to 8. These mean stacked frames are then transferred back to the data archive at LJMU, where a dark frame is subtracted and a flat-field correction is applied. This data (P_*_N_1.fits) is then made available to users for download. As described in the above section, two types of standard star observations (zero-polarization and polarized) are necessary to reduce RINGO2 data, which should have been obtained with the same mechanical mount position angle as the science data. The mount angle is specified in the FITS header by keyword ROTANGLE. Because the relative physical alignment between the polizer, the rotor and the CCD array is critical to the data reduction it is important to use only the correctly matched flat fields and standard stars to analyze science data. You cannot use standards before and after any hardware reconfiguration interchangably. The following list gives dates on which hardware were changed. Make sure your standards and science frames are not separated by any of these dates. 2010-11-10 Foreoptics changed to elliminate vignetting. 2011-02-15 - 2001-03-20 Drive belt broken. No data available from this time period. 2011-03-20 Returned to service following belt repair and filter re-seating. 2012-04-28 Cass bearing moved. MOUNT=0 before and after this date are not equivalent. For RINGO2 and RINGO3 a simple 60 second slew overhead is all that is required. No filter changes are possible, and the readout time is negligible.